So, how did we do last week? We’re you able to try and get your plank time above 45 seconds? If you weren’t able to, that’s OK. No better time to start then the present. As always, we will introduce new tips to help motivate you into bigger change every single Monday. This week again is all about expanding on our current Routine. Yoga has been a sacred practice for many centuries, but over the past decade has seen a huge explosion in North America. If you haven’t tried it yet, no better time. Get on Google and find a class. If you are out in the stix, or just simply don’t have the time, here is a great FREE intro class you can do right from your living room. Since we are big on posture, this class will focus on stretching the hamstrings(a major culprit in low back pain) and opening up the hips. Total time: 33 minutes. 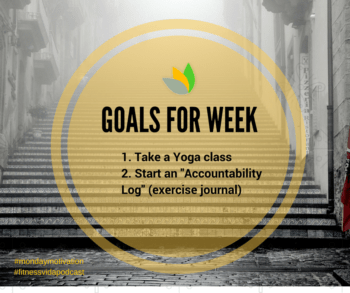 Also this week we are going to try to start an “Accountability Log” (or exercise journal). Since change is slow and methodical when loosing(or gaining weight) the correct and healthy way, this will help make sure that the things that need to be done each day are with you wherever you go and that things really are changing for the better. Follow the blog for my post on this in my “Top Ten Tips for Getting Back in Shape” series : Tip #5= the Accountability Log. If you are already doing Yoga, try adding a challenge to your Yoga routine like increasing class time or a new type. *Studies have shown that people who make small and gradual change over time have a much higher percentage of success then those that try to make drastic changes all at once. Even if you try 1 change/week and stick with it, big things will start to happen. What did you add to your routine in the past that made the biggest difference? Hello again, and welcome to the Fitness Friday Medley 2. If you missed out on last weeks post, you Read more!